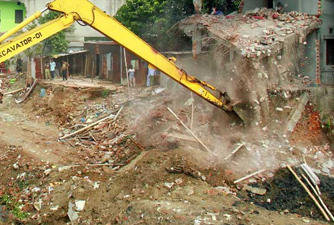 Bangladesh Inland Water Transport Authority (BIWTA) in an eviction drive demolished a total of 185 illegal structures built from Jahurabad to Palpara area in Mirpur, in the capital on Wednesday. The BIWTA conducted the drive following the order of the Shipping Ministry aimed at freeing the bank of Turag river from illegal encroachment, said a press release. The demolished structures include 11 two-storied buildings, 23 one-storied buildings, 38 partiually constructed houses and 112 tin-shed shops. BIWTA will resume the drive at Palpara of Mirpur Beribadh area tomorrow 9am, the release added.